The mural, which is being designed by artist Shawn James, is at the corner Jenifer Avenue and 30th Street, which was formerly the site of a dilapidated house that saw a lot of drug traffic. A nonprofit community group, the Coldstream-Homestead-Montebello Community Corp., worked with the city to have the house torn down and is now supporting the corner’s beautification. The mural “will fill the space with color and joy,” according to Natalya Brusilovsky, the group’s healthy neighborhoods coordinator. 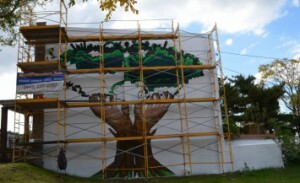 Anthony Smith’s project in the Landmark Self-Expression and Leadership Program was a mural that celebrated Newark’s musical history while supporting a thriving community.